We undersigned, concerned citizens of Gujarat and India, after visiting Saharanpur, demand to immediately dismiss Mr. Adityanath Yogi’s government in Uttar Pradesh in the wake of complete breakdown of law and order enforcement machinery in the state. 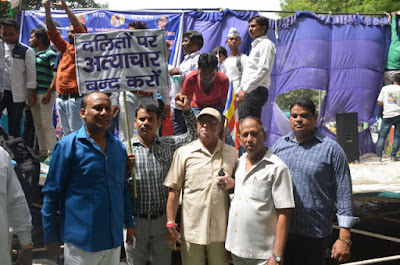 The situation is alarming as central government has to send Rapid Action Force to Saharanpur, the hotbed of caste conflict under the nose of a regime which has been boasting of Hindu Unity and brotherhood among so called higher and lower castes. In fact, Mr. Adityanath Yogi is running a quasi-military, armed gang named Hinu Yuva Vahini which is responsible for the present conflict where poor and margimalised communities like Dalits and Muslims are the worst sufferers. The Thakurs of Uttar Pradesh, who are coincidentally belong to Mr. Yogi’s caste are primarily responsible for the initiation of present perpetrated violence, unabated and aggravated under the nose of Thakur-friendly police and administration. BJP the present party in power at both, centre and state levels is determined to enforce political exclusion of Muslim community in our country, where our forefathers have painstakingly and purposefully nourished inclusive polity for all citizens of India. The present turmoil in Uttar Pradesh is indicator of another sinister aspect of BJP and that is - a well-planned strategy to undermine and destroy the growing awareness among SCs, STs and OBCs and minorities. Our Prime Minister Mr. Narendra Modi is mastermind in the very undemocratic process of drowning the ‘loudest voices’ of dissent. The witch hunt of Teesta Setalwad, use of CBI against political opponents and protection of fascist forces who are ready to shatter the composite and secular fabric of the nation. The Una incident of Gujarat was glaring example of state patronage to goons who roam and ruin lives of innocents in the name of ‘holy cow’. Lynching of innocent Muslims in Jharkhand, Murder of a Muslim trader in Alwar, uprooting Tribals in name of development, killings of Dalits on the altar of age-old caste prejudices – these all are ominous signs of a brutal, fascist state. Looking at the grim picture, we request you to intervene as early as possible.